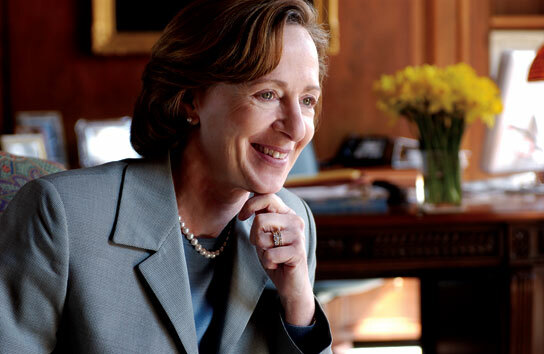 MIT’s new president discusses her life and work. Ann Bookman, executive director of MIT’s Workplace Center, explores how workers in the new economy integrate work and family. For 40 years, MIT’s Technology and Culture Forum has provided discussions about the ethical implications of science and technology. Grad student David Berry wins the Lemelson-MIT Student Prize for Invention for developing revolutionary approaches to treat stroke and cancer. Assoc. Prof. Eric Klopfer, director of MIT’s Teacher Education Program, is using game-like tools to educate kids. Mriganka Sur and other MIT brain scientists are teaming up with physicians to study and treat autism. Meiling Gao, who recently trained with a cardiovascular surgeon and who witnessed open-heart surgery, says she had the great experience thanks to the Undergraduate Practice Opportunities Program. Frank Quick ’69 of San Diego, who attended MIT on a scholarship, gives MIT $250,000 to establish a scholarship for others.